There might have been a mixed bag of weather conditions but the central Solent hosted some great, close racing for the second weekend of the 2014 Garmin Hamble Winter Series, this week comprising the first of two MDL Hamble Big Boats championship weekends. For the second race of the Garmin Hamble Winter Series the forecast predicted a light Northeasterly wind that would build to around 17 knots as the day went on, and so it proved, with all classes fitting in two races from a startline near Hill Head. The big boats of IRC 0 were first away. Niklas Zennstrom's Farr 45 Kolga won both races, ahead of a brace of J/111s – Louise Makin's Kolga and Chris Body's Icarus with two 2nds and two 3rd places respectively. In IRC1, Bernard Olesinski's X-40 Xinska improved on her 2nd place last week to score two firsts this week. Tim Octon's Doyle Sails and Nick Rawbone's Playing Around took a 2nd place apiece. In IRC2, Robbie and Lis Robinson's Hot Rats leads the class overall after their win in the first race of the day, ahead of HOD35 Malice. They finished 2nd in the second race behind Richard Searle's JPK1010 Pincer Movement. IRC 3 saw a first and second apiece for two J/97s, BlackJack II and ETB Tyres Just Like That, who now sit a point apart at the top of the leaderboard. John Noe's La Nef IV had two thirds. In the J/109s, Roger Philips' Designstar 2 extended her lead over the rest of the fleet with another two first places. Nigel Goodhew's Persephone did the same in the Sigma 38 class, giving her a 3-point lead over Chris and Vanessa Choules in With Alacrity. As last week, IRC 4 had the smallest boats but the biggest entry and some of the closest racing in the fleet. Toby Gorman's Sigma 33, Stan the Boat sailed a blinding day to win both races. Bernard Fyans' stalwart Erik the Red came 2nd in the first race, with Sam Laidlaw's S&S 37 Clarionet taking 2nd in the final race of the day. That leaves Erik in 2nd place overall. Race day sponsor was the Bugle, who generously provided competitors present at the prizegiving with £30 vouchers for food and drink. The weekend also hosted the first of two MDL Hamble Big Boat Series weekend, featuring racing for Farr 45s, J/111s and IRC0 and 1 classes keen to finish off their season with some close and exciting racing. On Saturday the fleet sat under AP for 3 hours awaiting the breeze, but eventually their persistence paid off and a light breeze filled in which allowed the race team to fit in two races on a short windward-leeward course. The Big Boats raced with the main Garmin Hamble Winter Series on Sunday. In IRC 0, Tokoloshe II, a GP42 owned by Michael Bartholemew, leads overall after two firsts and two second places. She is four points ahead of Niklas Zennstrom's Kolga, which scored three third places and one first, and Ben Saunders' Ker 40 Keronimo in third place. In IRC 1, Bernard Olesinski's X-40 Xinska scored four bullets to top the class. Behind her, Jim Macgregor's Premier Flair took three seconds and a fourth to sit second overall, ahead of Nick Rawbone's 40.7 Playing Around in third, tied on points with Stuart Wilkie's Puma in fourth. The J/111 class was topped by Cornel Riklin's Jitterbug, which scored two firsts and two seconds to place them 6 points clear of Chris Body's Icarus. Martin Dent's JElvis finished the weekend equal on points with JElvis but a place behind her on countback, in third. 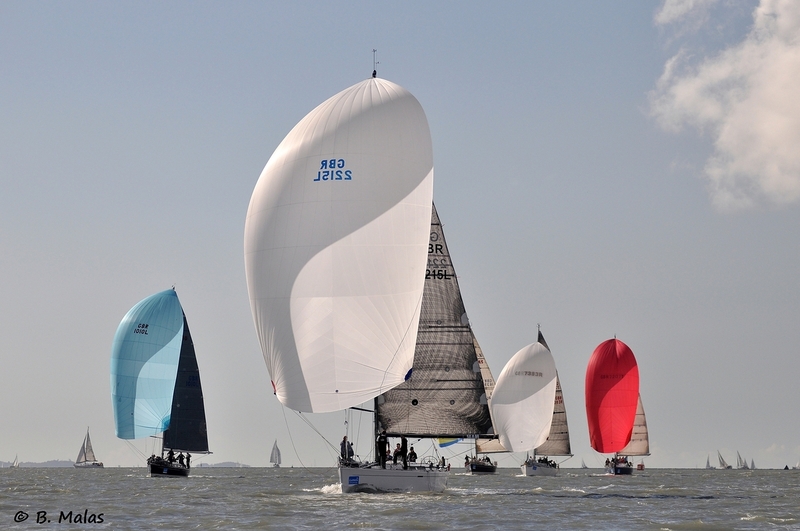 The MDL Hamble Big Boat Championship returns for its final weekend in a fortnight. Next weekend sees the third Garmin Hamble Winter Series race day and the final weekend of the Doyle Sails Hamble One Design Championships. We look forward to seeing you there!